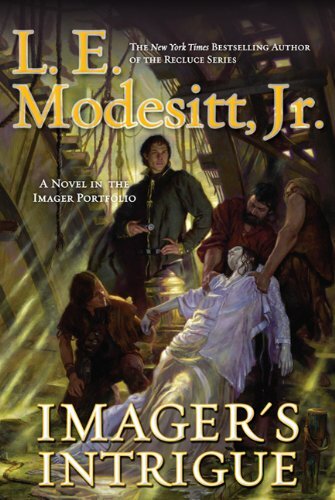 Thanks to the generosity of the folks at Tor Books, I have three copies of L. E. Modesitt, jr.'s Imager's Intrigue for you to win! For more info about this title: Canada, USA, Europe, AbeBooks. In Imager, the first book of the Imager Portfolio, we met Rhennthyl, an apprentice portrait artist whose life was changed by a disastrous fire. But the blaze that took his master’s life and destroyed his livelihood revealed a secret power previously dormant in Rhenn; the power of imaging, the ability to shape matter using thought. With some trouble, he adapts to the controlled life of an imager. By Imager’s Challenge, Rhenn has become a liaison to the local law forces. He finds himself in direct conflict with both authorities and national politics as he tries to uphold the law and do his best by the people of his home city. Now, in Imager’s Intrigue, Rhenn has come into his own. He has a wife and a young child, and a solid career as an imager. But he has made more than one enemy during his journey from apprentice painter to master imager, and even his great powers won’t allow him to escape his past. The rules are the same as usual. You need to send an email to: reviews@(no-spam)gryphonwood.net with the header "INTRIGUE." Remember to remove the "no spam" thingy. And thanks to the author, here's an extract to whet your appetite! ….Then I walked back to the duty coach and climbed in. As Lebryn eased the coach away, I picked up the first of the newsheets – Tableta. The lead headline stated “War Looms in Cloisera.” The story was about the increasing tension between Ferrum and Jariola. While the two had reached a truce after the undeclared “winter war” of 756-757, when the troops of the Oligarch of Jariola had finally pushed the Ferrans back to the pre-war borders and regained control of their coal mines, no peace agreement or treaty had ever been signed. Both nations had armed forces poised along the border, and the two had never resumed diplomatic relations. According to the Tableta story, the Ferrans were deploying a new steam-powered land cruiser, claiming that it could operate in the coldest of winters, unlike the earlier models that had broken down in hilly lands of Jariola during the cold winter months. The story in Veritum was similar, but the second newsheet had another story that I found intriguing, not to mention disturbing. The grain warehouse of a wealthy freeholder near Extela had been torched right after harvest, and that was the latest in a series of grain warehouses that had burned across the southeast of Solidar. All the warehouses, except one, had belonged to freeholders, rather than High Holders. Then there was a rather cryptic and short story that reported on an explosion of an undetermined nature outside the Place D’Opera on Samedi night after the premiere of The Trial of Lorien. The explosion had damaged a coach, killed several people, and injured a number of bystanders. I frowned. No one had contacted me. Then, the Place D’Opera was in Second District. Seliora had mentioned the opera because Iryela and Kandryl had wanted to see the premiere, but couldn’t, because of a dinner at his father’s chateau. The dinner might even have been in celebration of Frydryk’s and Alynkya’s engagement. Or it might not have been, given the social obligations and intrigues that swirled around High Holders. I’d wanted to see the opera for a different reason, although I was certainly not willing to pay the prices for the premiere. Lorien had been the son of Rex Defou, who’d been removed as ruler and rex of Solidar by Alastar, the first imager to be titled a Maitre D’Image – the most powerful of imagers, of whom there were none at present in the Collegium. Historians had always questioned whether Lorien was strong and temperate or weak-willed and subservient to the High Holders of the time. It would be interesting to see how the composer and the librettist had seen Lorien. But… why weren’t there more details about the explosion in the newsheet? For the moment, I couldn’t do anything about it, and I finished reading Veritum just before Lebryn eased the duty coach to a stop outside Civic Patrol headquarters. I stepped out of the duty coach and adjusted the gray visored cap that imagers wore when on duty off Imagisle, a cap similar to those worn by the Civic Patrol, except that mine bore the four-pointed star that symbolized the Collegium. Although the headquarters of the Civic Patrol of L’Excelsis was slightly less than a mille from the south end of Imagisle, my circular trip via NordEste Design had taken four milles. Even had I gone directly from the Collegium, the trip would have been more than two milles because there wasn’t a bridge on the south end of the isle that held the Collegium. There really wasn’t much difference in distance between going to headquarters and going to my Third District station, although the station was almost two milles northwest of headquarters. The Civic Patrol headquarters building was of undistinguished yellow brick, with brown wooden trim and doors. There were three doors spaced across the front. The left one led to the malefactor charging area, and the right door was permanently locked. The middle double doors were set in the square archway above two worn stone steps leading up from the sidewalk. I took them and stepped inside and past the table desk, with a graying patroller seated behind it. I hurried up the time-worn dark oak steps to the second level and turned right, going past one door before stepping in through the open door to the conference room, with its long oval table of polished but battered oak and the straight-backed chairs arranged around it. Three wide windows, both closed, were centered on the outer wall. They offered a view of the various buildings on the north side of Fedre, but not so far enough to see those along the Boulevard D’Imagers. There were no pictures hung on the walls, and only three unlit oil lamps in sconces spaced along the inside wall. I was the second to arrive. Bolyet, the captain of Fifth District, was already there. He’d replaced Telleryn a year before, when Telleryn had earned out his stipend and moved to Kherseilles with his wife. He nodded, but before he could say more, Subunet, of First District, entered, trailed by Hostyn and Jacquet, who had black circles under his eyes. Several moments later, Kharles followed. Subcommander Cydarth walked in directly behind Kharles. He had black hair and a swarthy complexion. Part of his upper right ear was missing. “The commander will be right here.” His voice was so low it actually rumbled, and I recalled how I’d reacted when I’d first heard him speak years before. I’d read of voices that deep, but I’d never heard one until then. We all remained standing for several moments, until Commander Artois entered and shut the door behind himself. Three or four digits shorter than I was, he was also wire-thin with short-cut brown hair shot with gray. His flat brown eyes never seemed to show emotion. He sat at the end of the table, with Cydarth taking the place at his right. The rest of us sat, those in the first three districts to his left, those in districts four through six on his right, if below the subcommander. Jacquet said nothing, but the fingers of his left hand drummed silently on the edge of the table. Cydarth nodded, thoughtfully, and I wondered why. Cydarth looked sideways at Artois, not quite questioningly. “High Councilor Suyrien has requested that the Civic Patrol and its patrollers exercise special vigilance around locations where wealthy factors or High Holders are likely to be present, except for the area around the Council Chateau, where Council security will exercise such vigilance.” Artois’s voice was matter-of-fact, as if he’d been requested to deliver such a request, knowing that it was probably close to useless. past few years, if far more slowly than I had hoped. From there on, the meeting dealt with administrative details, and it lasted another glass. When the commander and subcommander finally left, the rest of us stood. With Bolyet, I knew, the question wasn’t a polite formality. “What do you think it is?” asked Bolyet. Jacquet shrugged. “Too direct for a High Holder, unless it’s a High Holder not trying to have it traced to him. The bomb had a directed blast pattern, and that means someone who knows explosives. Could be retired Navy armorer.” He looked at me. “Some of the imagers at the armory could build something like that, but none of the ones who could build it would be able to use it very well. They’d also be facing an immediate death sentence if they did.” I frowned. “If you could send me a report on the bomb, though, I might be able to run it by some armory specialists and find out more about who did build it. I could also use the information to make sure someone didn’t reveal something to someone they shouldn’t. I didn’t mention that I could also eliminate anyone on Imagisle as a possibility… or discover if they were. “We can have the boys keep their eyes and ears open,” promised Bolyet. I just nodded. Then Bolyet and I followed Jacquet out into the upper level hall and then down the steps and out onto the sidewalk. “I will.” I grinned. We both knew that Alsoran had agreed to the transfer because it meant his making lieutenant earlier than otherwise would have been the case and because he and I got along, which wasn’t always the case between district captains and their lieutenants, as I well knew after suffering through three years of working with Warydt, his predecessor. I hailed the next hack to take me to Third District station. As I rode up Fedre to Sudroad, I couldn’t help agreeing with Jacquet that the explosion was a symptom of something far worse, although I couldn’t have said why at that moment.